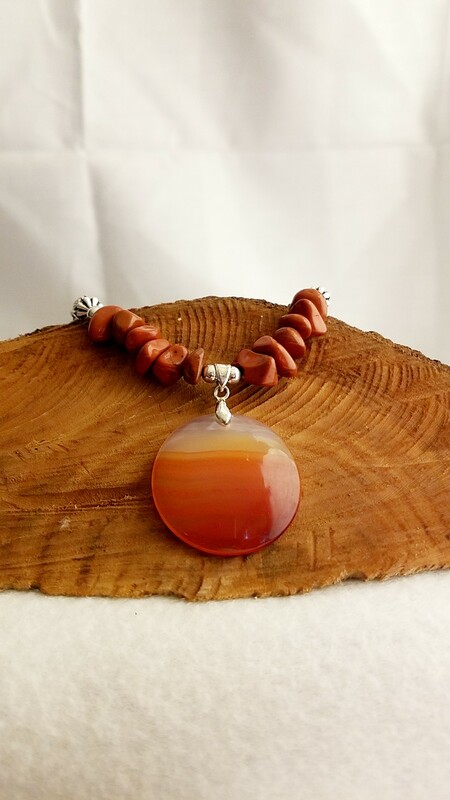 This Luxurious Agate Pendant Necklace is elegantly unique. This Luxurious Agate Pendant Necklace is elegantly unique. Pair it with an LBD or your favorite jeans elevate the outfit to a new level. 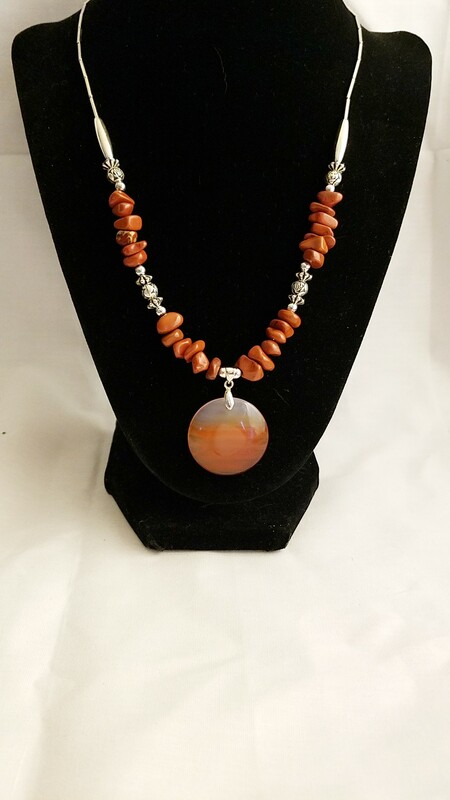 The rich red jasper nuggets paired, with the exquisite colors of the red agate pendant make a unique necklace. This is a one of a kind item and can’t be back ordered or custom ordered in a different color. This is a piece that my Mother made. You will have a piece like no other person has. Jasper – a form of chalcedony, an opaque, impure variety of silica, usually red, yellow, brown or green in color; and rarely blue. The red color is common due to iron (III) differentiation in what is basically a Chert. The mineral breaks with a smooth surface and often used for ornamentation or as a gemstone. Agate –is a variety of chalcedony formed from layers of quartz which usually show varicolored bands. It usually occurs as rounded nodules or veins. Often tiny quartz crystals form within the stone 1and add to the beauty and uniqueness of individual stones. These crystals called druzy (sometimes misspelled as druzy). There are many colors and variants of agate. 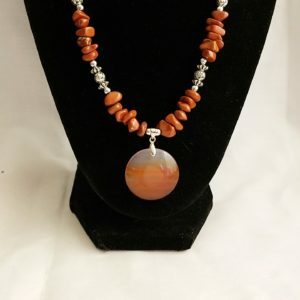 These gemstones Agate and Jasper have been used for different metaphysical healing properties. However, Please Note: Crystal properties listed on this site are for information purposes. Always consult a physician for proper medical treatment. This unique item can’t be back ordered or custom ordered in a different color. This is a piece that my Mother made, and since she has passed. You will have a piece like no other person has. 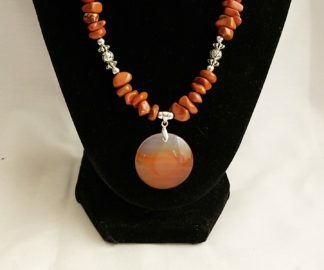 Therefore if you would like more information about the gemstones and materials used in making my handmade items like this, Luxurious Agate Pendant check out the Materials Description Page. Let this Luxurious Agate Pendant Necklace make your outfit look elegantly unique.